Wasted is a post-apocalyptic dungeon crawler that unabashedly takes the piss out of Fallout. It’s about exploring Coolers (read: Vaults), meeting and murdering zany characters, and getting so drunk that you acquire super powers. The game just launched on Steam earlier this week, and you can watch me play it in the video below. My overall impressions? 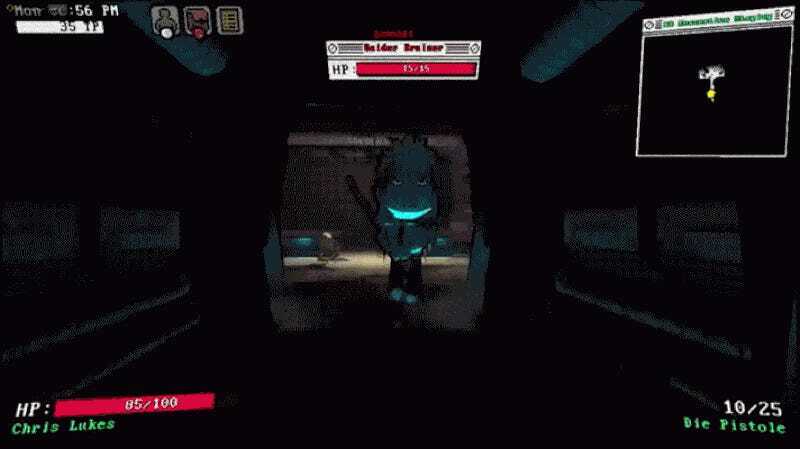 Wasted is a fun, Fallout-flavored take on roguelike dungeon-crawling. It’s up to its gills in dumb gags (for example, a gun that’s only great if you aim exclusively for characters’ crotches) and references (computers with absurd notes on them, the S.H.O.T.S. system, Fallout’s trademark conversation zoom-in), but the game never quite sinks to the level of being dumb itself. It’s also tough as hell. When characters die, they die permanently, and Wasted’s wastes are no walk in the park. I’ve only played for a few hours, so I’m not certain if I just haven’t quite scaled Difficulty Curve Everest and reached a comfortable peak, or if the game needs some better balancing. There’s a mechanic were, if you linger for too long on any level of a Cooler, you get hunted down by a mega-enemy called an SOB. It adds fun urgency to the proceedings, but it also feels contrary to the game’s otherwise exploratory bent, which allows you to solve problems (read: bad guys) in multiple ways. On top of that, maps are randomly generated, which leads to no small number of dead ends. If you’ve taken a wrong turn and then an SOB shows up, you’re in big trouble. Frustratingly, it often feels like it’s more luck’s damn fault than your own. There are also some pretty jarring difficulty spikes as you make your way through Coolers. Protip: when you come across booze—which grants you powers, but also sends you back to your base with a hangover—probably drink it. It might seem a bit obtuse at first, but it’s basically how the game handles character progression. I’m pretty into Wasted right now. As with any good roguelike, I can’t stop trying to improve my runs little-by-little. This one also has characters to meet and quests to take on, so I feel like it’ll keep me coming back for a while.